A week or so ago I was headed home after a long newborn session in Montrose. I love that little stretch of corn fields between Olathe and Delta and often I drive that road at sunset and think, “man…if I only had my camera.” or, “I wish I was on the other side of the road.” and this evening was no different. The sun was so pretty filtering through the clouds and making the corn just glow. I was rocken out to K-LOVE, W was crashed in his carseat in the back. It started to rain. On the radio they said something about how it was important to make time to do the things you love. But I was almost to Delta. My camera was on the seat next to me. But I need to get home and cook dinner. I don’t shoot for me very often. But I’ve had a long day and I still need to unpack. I flipped a u-turn and drove back. I kept thinking that the rain was really coming down now and that the sun would be gone and that beautiful light just wouldn’t be there. As I pulled over, the rain stopped and I got my shot. No real reason for this post…just to share a beautiful sunset over our beautiful Colorado. And to remind you to do a little something for yourself today. You deserve those few minutes. 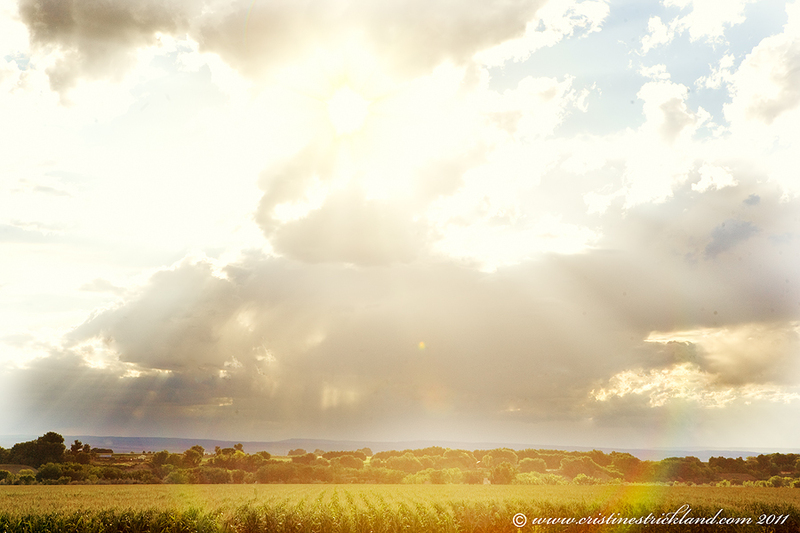 This entry was posted in misc., personal and tagged beautiful light, cristine strickland, end of summer, evening photography, grand junction photographer, Olathe sweet corn, photography | Bookmark the permalink. This is absolutely stunning! Gorgeous, gorgeous light!